CAPE CANAVERAL, Fla. — NASA's sending a probe to an asteroid, and when that new spacecraft reaches its destination, it will usher in a new era of understanding of the early solar system, a panel said. The Origins, Spectral Interpretation, Resource Identification, Security, Regolith Explorer (OSIRIS-REx) spacecraft, launching tomorrow (Sept. 8), will explore the asteroid Bennu, searching for traces of the material that helped to build the sun and the early planets. Eventually, the spacecraft will return to Earth with a sample of the asteroid for scientists to analyze in exquisite depth. "Sample return is really at the forefront of scientific exploration," OSIRIS-REx principal investigator Dante Lauretta said at a press conference yesterday (Sept. 6). OSIRIS-REx will arrive at Bennu in 2018 and begin an extensive mapping campaign that will culminate in the selection of a site to sample. The spacecraft will then drift in to deliver a slow-motion blast to the rock that will kick surface material up into the probe's collecting dish. "This is going to be a treasure trove of material for scientists yet to come," Lauretta said. Not far from Earth, a dark stone orbits, potentially holding within it the secrets of the young solar system. Like its fellow asteroids, Bennu is thought to have formed soon after the sun, at around the same time as the solar system's planets. While the constant activity of volcanoes, earthquakes and erosion changed the chemistry of Earth's material since that time (as likely happened on other planets), Bennu remains virtually unmarred. A sample of the asteroid should therefore provide a time-capsule-like glimpse of the planets' youth, the researchers said. "The crux of OSIRIS-REx is origins, the search of the origin of the solar system and of life itself," OSIRIS-REx project scientist Jason Dworkin said. "For that [search], it's all about the sample." To complete its planned science objectives, OSIRIS-REx needs to collect a least a 2-ounce (60 grams) sample from Bennu. Once that material lands back on Earth, scientists will probe the sample with complex experiments that just aren't possible in space. When NASA's Stardust mission returned particles of the Comet Wild-2 in 2006, scientists sliced off micron-sized pieces to study beneath sensitive equipment. Those instruments wouldn't have survived being launched into space, so the sample return allowed scientists to manipulate the particles in ways that would be impossible on board bulky spacecraft. Scientists researching OSIRIS-Rex's sample will keep a keen eye out for organic-rich material, which asteroids are expected to host in varying degrees. Organic molecules — those made from carbon — and molecules like water are considered key ingredients for life to evolve. While Bennu today is too cold for life, scientists think that other asteroids could have delivered those ingredients to the early Earth through violent collisions. Despite their devastating immediate effects, the energetic impacts could have deposited material on the hot young planet that allowed life to evolve. While traces of those collisions would have been erased by Earth's changing crust, Bennu provides a glimpse of what the deliveries might have looked like billions of years ago. "This will be the largest sample-return mission since the Apollo era," said Christine Richey, OSIRIS-REx deputy program scientist at NASA Headquarters in Washington, D.C. The returned capsule will provide a bounty not only for today's scientists, but also for future generations, Richey said. Three-fourths of the sample will be archived for later study, allowing scientists to answer questions that haven't been thought of today, using instruments yet to be imagined. The sample that's brought back to Earth won't be the only science that comes from the mission. 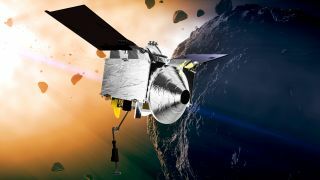 Before the probe swoops in to gently kiss the asteroid and gather a sample, OSIRIS-REx will spend somewhere between 18 months and two years extensively mapping the asteroid. Not only will researchers use the global map to determine the best site to collect from, but they will also measure the distribution of organic material across the surface. "We will be able to see an object the size of a penny on the surface of Bennu," said Daniella DellaGiustina, OSIRIS-REX's lead imaging-processing scientist. The detailed maps will help scientists understand more about the part of the asteroid that their sample comes from, she said. "Once we have a sample of Bennu, the maps will also provide critical context for that sample," DellaGiustina said. Detailed cartography will not only reveal how Bennu is put together, but will also provide insight into the composition of other asteroids. The 1,600-foot (492 meters) asteroid dances in a path around Earth, and the odds of this object colliding with the planet are well under 1 percent.But it's not the only space rock nearby, and understanding its structure and composition will help should a more threatening asteroid be found, the researchers said. OSIRIS-REx will also study how the sun's light can shift the orbit of an asteroid. As energy from the sun hits rocks in space, that energy can provide a small thrust that can gradually shift asteroids' orbits, Lauretta said. "Since we've been monitoring the asteroid in 1999, its orbit has changed by over 160 kilometers [100 miles]," Lauretta said. While scientists think they understand this process, known as the Yarkovsky effect, they have yet to study it in action on a space-bound asteroid. Watching the sun's energy push Bennu ever so slightly will help improve models of other rocks in space, creating more accurate simulations for their future orbits, Lauretta said — and whether or not they could impact Earth. "We're going out into the unknown. Bennu is an unexplored world," Lauretta said. Although scientists have studied Bennu in depth using both ground- and space-based instruments, the space rock could still provide unexpected surprises, according to the researchers. With the help of OSIRIS-REx, many of the questions about Bennu can one day be answered. "We're going to explore this world, and we're going to bring back a sample," Lauretta said. "We've got great science ahead of us."